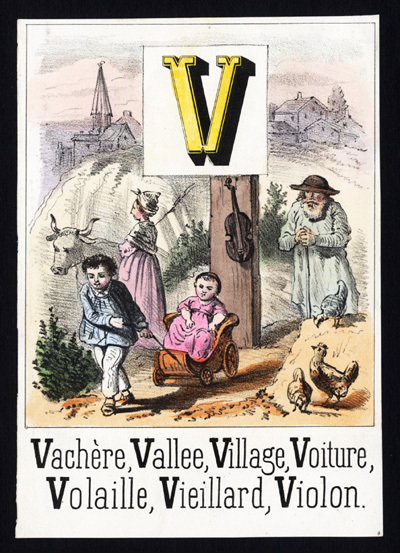 Subject: Plate : This plate deals with the letter V of the French alphabet: Vachere (Cow, Valley, Village, Vehicle, Volaille (Poultry), Vieillard (Old person), Violin. Condition: Good. General age related toning and minimal staining. Medium: Hand coloured crayon style lithograph. Size (in cm): The overall size is ca. 10 x 14 cm. The image size is ca. 9.5 x 13.5 cm. Size (in inch): The overall size is ca. 3.9 x 5.5 inch. The image size is ca. 3.7 x 5.3 inch. Description: This antique print originates from an unknown source. Published in France ca. 1850.